Traditional RDBMS are inadequate when it comes to interpreting and analyzing massive quantities of machine-generated IT data. Discover a unique approach to handling large, semi-structured or unstructured time-series data. 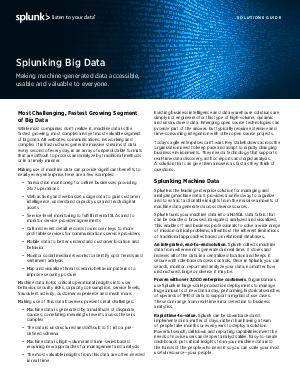 Splunk can be deployed in a matter of days to provide rapid cross-correlation between different data types-giving you unprecedented operational visibility for better informed decision making.